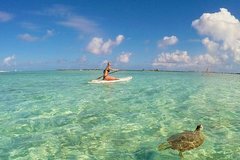 Excursiones y tours archivos | Islas Turcas y Caicos. Guía de viajes y turismo. Islas Turcas y Caicos. Guía de viajes y turismo. Private Tour: Providenciales Catamaran Cruise. 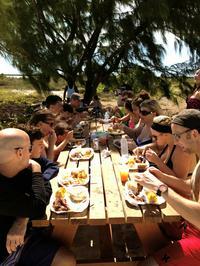 Experience Turks and Caicos like a VIP on this private catamaran tour from Providenciales. On board your own boat with your own captain to drive you around, you can snorkel, fish, dive for conch, tube, listen to music or sunbathe on the catamaran’s rooftop lounge — this customizable tour allows you to spend your time on the water however you wish. Choose either a half-day or full-day tour to suit your schedule. Rum punch, beer, soda and lunch are included. Inicio en: Providenciales, Turks and Caicos. Recorrido privado: crucero por Providenciales al atardecer. Asista a una magnífica puesta de sol en las islas Turcas y Caicos desde su propio barco privado en este recorrido de 3 horas en catamarán con salida desde Grace Bay Beach. Navegue por la costa de Providenciales hasta un arrecife de coral donde podrá practicar buceo de superficie con peces tropicales. A continuación, contemple la puesta del sol mientras disfruta de un vino o de un ponche de ron acompañado de quesos importados en esta excelente manera de comenzar la noche durante sus vacaciones en el Caribe. Excursión privada: crucero de lujo por Providenciales. Disfrute de las hermosas aguas de las Islas Turcas y Caicos en esta excursión privada de lujo. Ideal para pasar un día en el agua con su familia o amigos, esta excursión por Providenciales desde Grace Bay es totalmente personalizable, por lo que puede hacer lo que más le guste. Practique esnórquel, nade, pesque, haga tubing o sumérjase para capturar caracolas. Explore las pequeñas islas vecinas o broncéese en la cubierta delantera del barco. Relájese con una copa de vino espumoso o ponche de ron. Bebidas, aperitivos y almuerzo incluidos. Crucero de buceo de medio día por Grace Bay desde Providenciales. Pase una relajante mañana o tarde en las aguas turquesa de Providenciales en este crucero de medio día de buceo desde Grace Bay Beach. A bordo de un cómodo catamarán de dos pisos, navegue por Grace Bay y las islas vecinas como Little Water Cay y Pine Cay. Buceo de superficie con tortugas marinas y un impresionante arrecife de coral, y visite el recinto de conchas para disfrutar de todo un festín con un ceviche fresco. Equipo de esnórquel, aperitivos y cerveza, ponche de ron y otras bebidas. 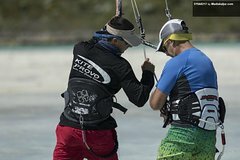 Intermediate or Advance Private Kiteboarding Lesson on Long Bay Beach. Fully customized lessons to meet your goals. These lessons are done one on one (1 instructor per 1 student). You will have more time with the kite in your hands and will have the one on one attention of your instructor. Your private instructor can tailor the lessons specifically to your needs and desires. You can comfortably progress at your own rate. Perfect for advanced beginners, intermediates, and advanced kite-boarders. Guided Stand-Up Paddleboard Tour Through Mangrove Estuaries. Mangrove Island Tour – Guided eco tour. This is more about “Connecting You With Nature” than open water paddling. A magical journey through the shallow water estuaries. We recommend you start with this tour as it offers amazing diversity and is the easiest tour so suited for all skill levels. We are experts in the eco-system and share with you the science and nature of this magical world. Our eco-guides have a trained eye and will point out things often missed by the untrained eye. Our eco-guides are widely educated in the plant life, the wildlife, biology, and chemistry of the marine aquatic eco-system. Be mesmerized by their knowledge while having a close encounter with turtles, baby sharks, rays, snapper, small reef fish, herons, anemones, invertebrates’, conch, egrets, and pelicans. If beautiful sights and picturesque views are your thing, then this is the tour for you. Fast Track Camps – First lesson experience only. We combine you with others. $350.00 per person($116.66/hr) Includes the 12% government taxes! Designed for those taking their very first kiteboarding lesson and would like to learn to kiteboard at a discounted rate. The rate is discounted because you either provide a group or we combine you with others. This is a group rate lesson and we will combine you with others for groups generally 2 but could be up to 3 people. Our instructors are trained in communication and use group dynamics to engage everyone in the course all the time. Switching the person flying the kite often, allows for your scope of vision to change and will actually accelerate your learning process. This also provides mental and physical breaks, while continuously learning. Providenciales Island Tour. Come discover the landscape at the Cheshire Hall Plantation on this half-day tour from one side of the island to the next as your expert guide explains the various ecosystems and wildlife that thrive here. At Sapodilla Beach, admire the turquoise water while making unforgettable memories. Then take an off-road drive to The Hole after purchasing lunch at beach side restaurant. Shared Arrival Transfer: Providenciales Airport to Hotel. Book this transfer from Providenciales International Airport to your Providenciales accommodation in Turks and Caicos so you don’t waste time waiting for a taxi or other transportation. Simply select a time that suits your flight schedule. We will meet and greet you at your destination while a cold air-conditioned vehicle awaits you. Inicio en: The Bight Settlement, Turks and Caicos Islands. Crucero de esnórquel con almuerzo tipo barbacoa durante un día completo desde Providenciales. 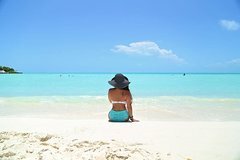 Tómese un descanso de su estancia en el complejo en la playa para disfrutar de un día completo en catamarán por las playas septentrionales de Providenciales. Disfrute de actividades acuáticas, como bucear en Grace Bay, nadar en playas de arena blanca en islas deshabitadas. Observe distintos animales, como tortugas marinas e iguanas, y disfrute de un suculento almuerzo tipo barbacoa compuesto de costillas, pollo, maíz y postre. Broncéese en la terraza de la cubierta superior y refrésquese con cerveza, refrescos y ponche de ron durante todo el día.